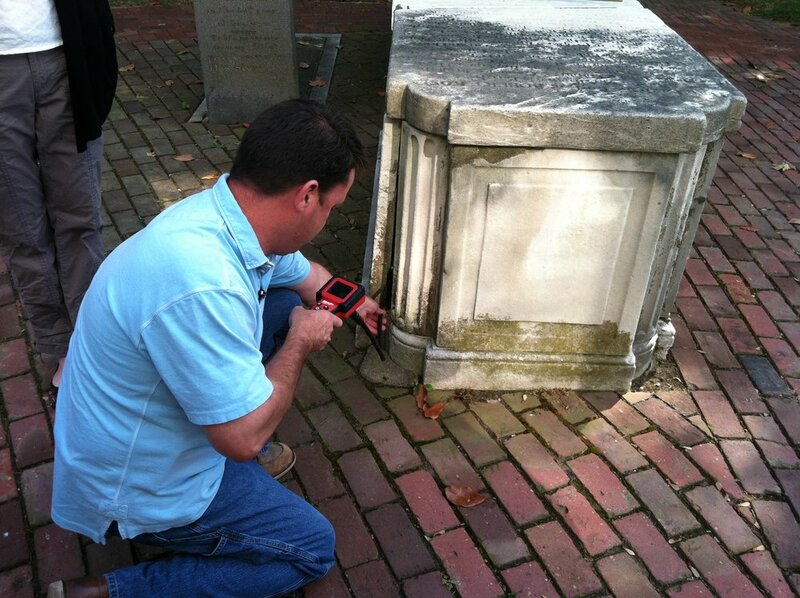 The Robert Rose monument (1751) is the earliest visible marker at historic St. John’s Church, Richmond’s first public burial ground from 1799 to 1822. Named one of Virginia's Top 10 Most Endangered Artifacts List in 2013, a 3-year restoration project was completed in May 2017 by contractor Ashley McCune and conservator Howard Wellman. The monument has since been removed from Virginia’s Most Endangered Artifacts List. Mr and Mrs. James G. Rose, Jr.
Sarah Whiting, Executive Director of St. John’s Church Foundation and The Reverend Amelie Wilmer, Priest in Charge of St. John’s Church, led the re-dedication. Bagpiper Tim McLeod performed traditional Scottish tunes. The project began in 2014. The first step was to explore the monument, both inside and out. 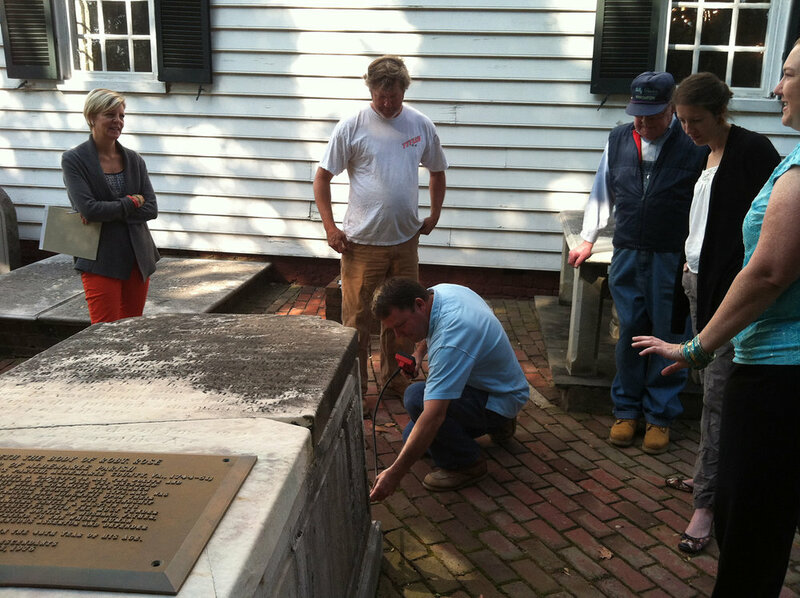 Here contractor Ashley McCune sends a camera inside the monument as St. John’s Church Foundation staff, volunteers, and members of the Va Dept of Historic Resources look on. Weather and other delays pushed the project into 2016. Once contractor Ashley McCune stabilized the core, conservator Howard Wellman and crew reset the heavy marble top. The “Top 10” program was designed and implemented by the Virginia Association of Museums to create awareness of the importance of preserving artifacts in the care of museums, libraries, and archives throughout Virginia. Before conservation; note the large crack on top of tomb.